* This post contains some affiliate links. By purchasing a product or service through these links you are helping to support this blog at no extra cost to you. We only recommend products we personally use and love! The lush green rolling hills on the outskirts of Beijing is the setting most captured of the Great Wall of China. The wall, composed of gray bricks, runs like a spine along the ridge of the mountains rising and falling with the terrain, preventing any intruder from crossing the mountain range. What most forget, however, is that the wall is over 2000 miles long. 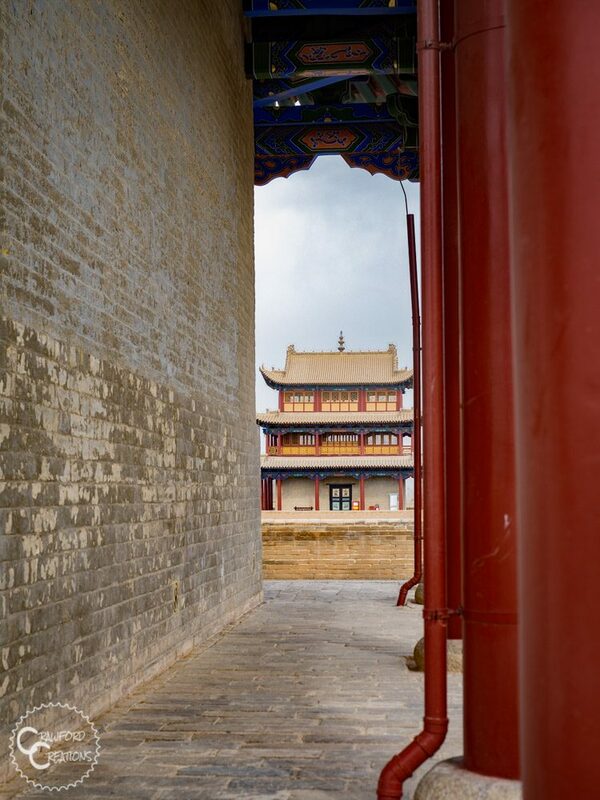 In Shanhaiguan it crashes into the sea, in Beijing, it flows over rolling hills, and 2000 miles away in Jiayuguan, Gansu Province, the wall traverses the desert, branching out like nerves from a spine to climb the surrounding mountains. 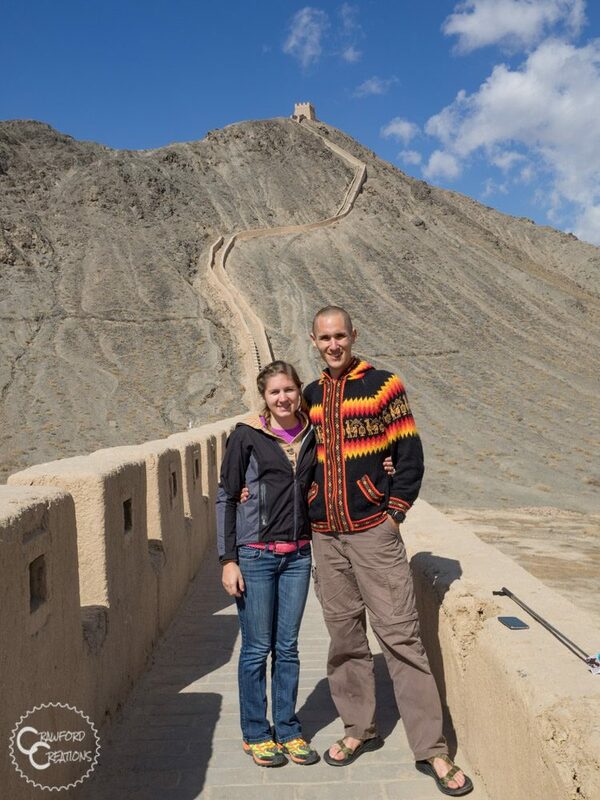 In Jiayuguan, grass is scarce and the mountains are nothing but sheer rock and cliff faces. This section of the wall is made not with stone or brick, but with the earth itself, packed hard and shaped into what we now call the Great Wall. Contrary to the gray stone of Beijing the wall here is tan, camouflaging with the surrounding desert. The Jiayuguan Great Wall was constructed during the Ming Dynasty starting in 1372 and ending in 1540, taking 168 years to build. The wall was built as a fortress to protect the one remaining vulnerable entry point in a desert valley otherwise surrounded by mountains. 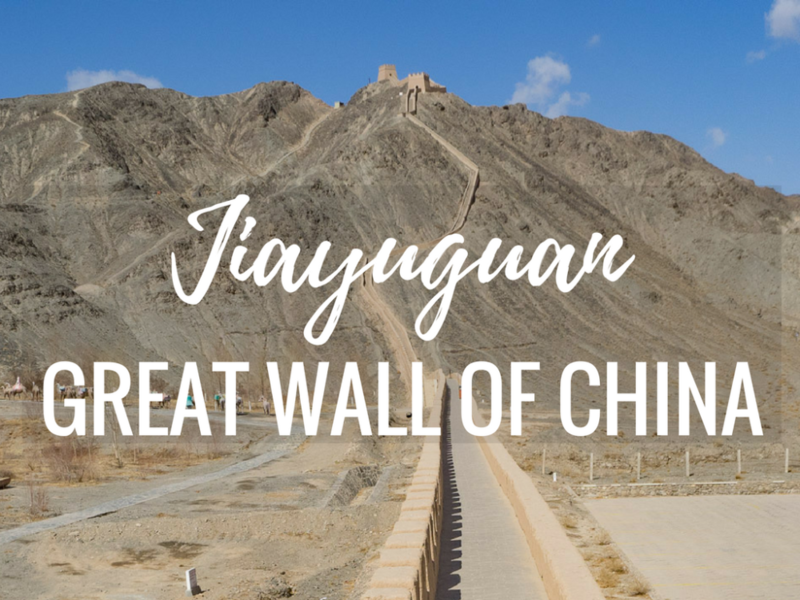 Between the Great Wall and the harsh rocky mountains, this area of Jiayuguan was considered impenetrable, earning it the name of “The First and Greatest Pass Under Heaven”. 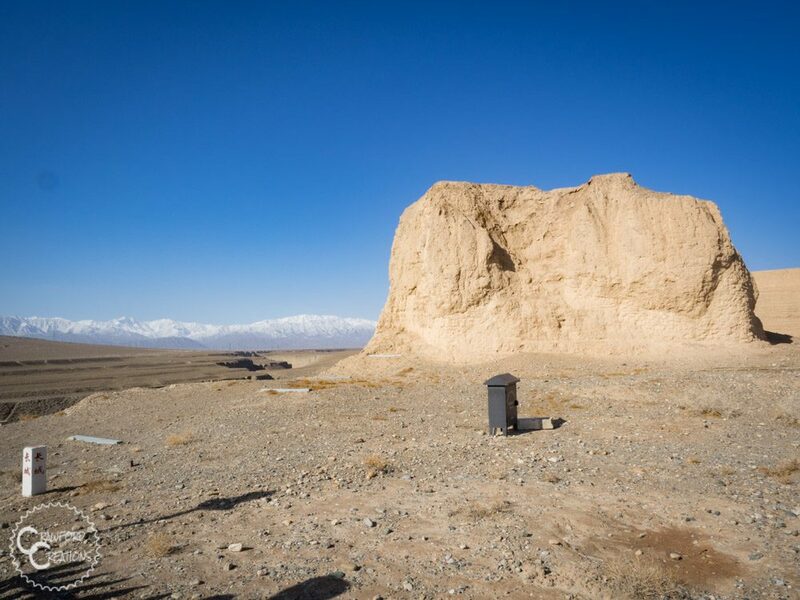 The pass marks the end of imperial China and the start of the Silk Road connecting China with the West. The Great Wall in Jiayuguan consists of 3 parts: Jiayuguan Fort, First Strategic Post of the Great Wall, and the Overhanging Great Wall. 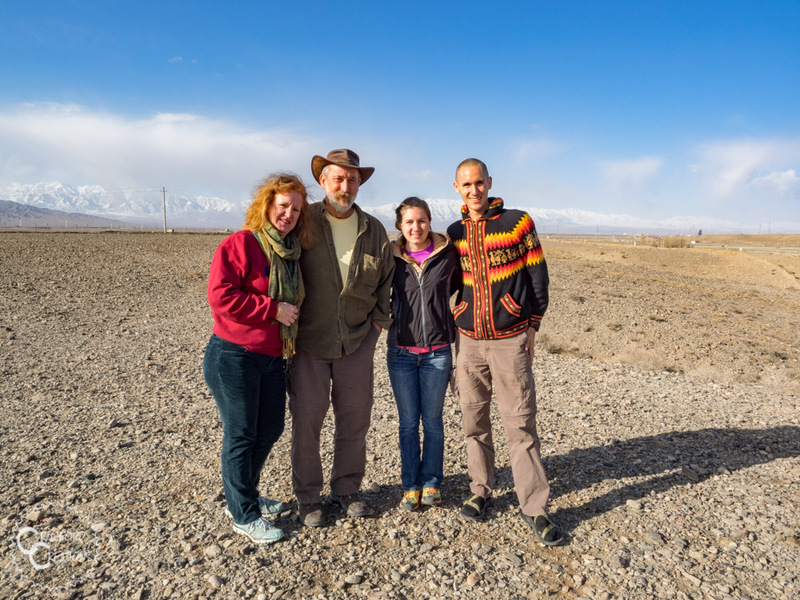 Pulled over on the side of the road for a family photo op in front of the snow-covered Qilian Mountains in Jiayuguan. Jiayuguan Fort is the most intact surviving section of the Great Wall. The fort creates what is basically a small walled city encompassing an area of 25,000 square meters, or 6 acres with a guard tower on each corner. It has only two entrances at the East and West gates respectively from which tourists can enter and exit the walled compound. 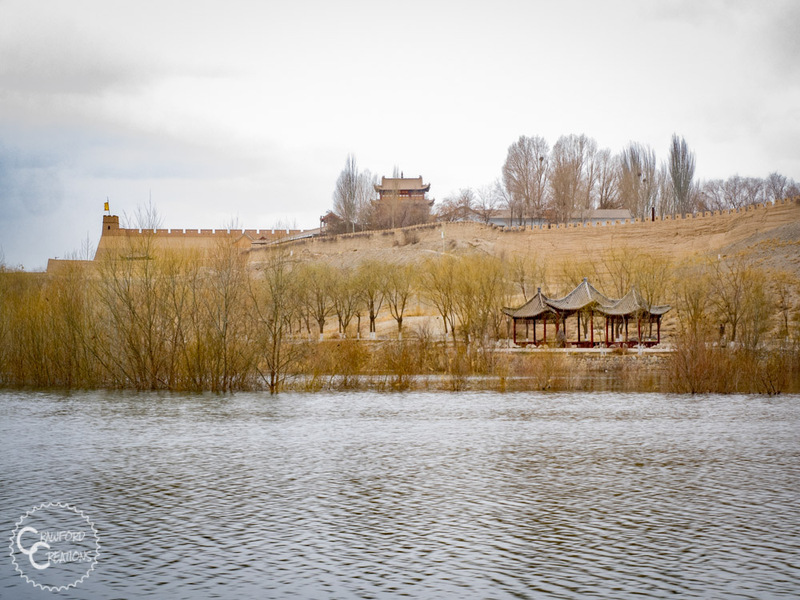 The fort is located 8km outside of Jiayuguan City making it easily accessible by taxi or bus. Walking into the fort you’ll be greeted by an elaborately decorated (an extremely photo worthy) gate. After snapping some photos, you’ll then be funneled in room-by-room through short tunnels towards the “city center”. The common grounds, for lack of a better term, at the center of the fort is where all the action is. Traditional activities such as target shooting, both with arrows and fake guns, and pony rides are all available for tourists to try their hand. Staircases on opposite sides of the walls allow you to climb to the top of the wall and walk around the perimeter of the fort. Walking on top of the wall we were struck by the juxtaposition of ancient fortress with modern factories. Un-restored Great Wall branches out from all sides of the fort ending at what are now coal factories stationed in the desert. In classic China style modern and ancient stand side by side fighting for position in China’s new capitalist culture. Heading into the center of the fort. Exiting the fortress on the opposite side we were greeted by a group of camels and horses, all tacked up and ready should we have wanted to take a ride. We chose not to and so did the few other tourists there with us, so I can’t comment on the quality of the experience, but if you do decide to try it please let us know how it is! 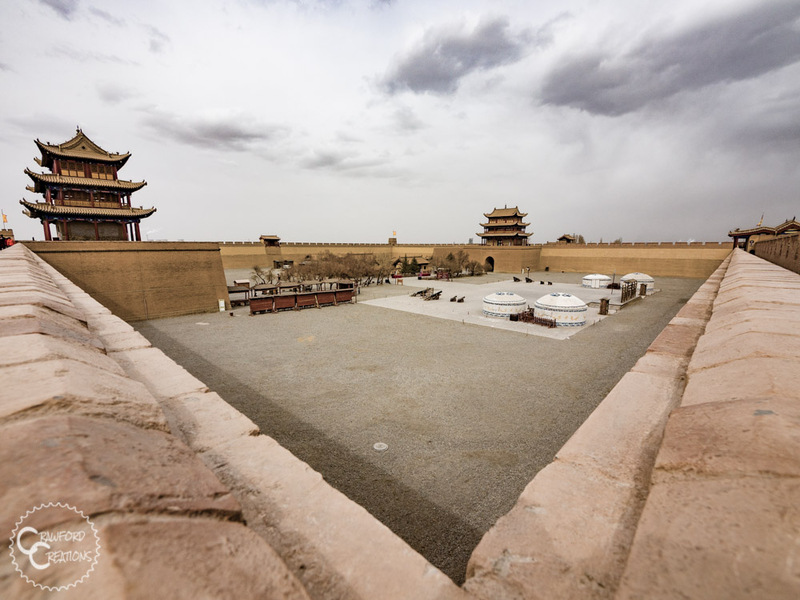 Also on the grounds at Jiayuguan Fort is the Jiayuguan Great Wall Museum. I loathe museums more than almost anything in the world, so again, no comment on quality here but it deserves a mention for any museum buffs out there who would like to take a look. To get to the museum walk along the path that follows the outside of the fortress for about 10 minutes and you’ll see it. At the center of Jiayuguan Fort. The First Post is literally as the name describes, the very first outpost built that marks the start, or end, depending on your perspective, of the Great Wall of China. The post lies another 8km down the road from the Jiayuguan Fort. Driving there the road follows an un-restored section of wall that has branched out from the fort. Along with following the ancient Great Wall, the drive also provides some stunning views of the snow covered Qilian Mountains. So stunning in fact that our driver even pulled over to take a picture of us with the mountains in the backdrop. Upon arriving at the entrance you are ushered through the gate and out onto a road on the other side. Here, elongated golf carts are waiting to drive you approximately 2km down the road to view the pillar, for an extra fee, of course. 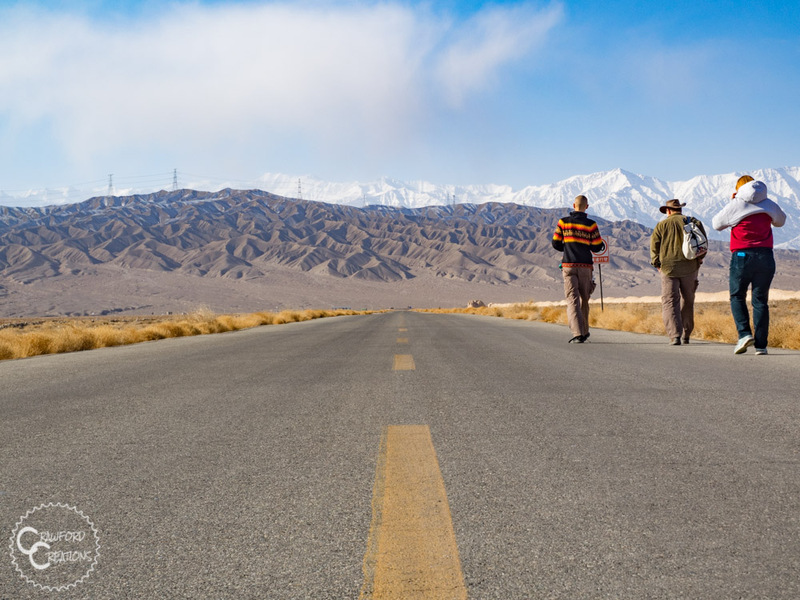 The carts are optional though, and we were so enamored with the views of the Qilian Mountains that we chose to walk down to the pillar and take the golf carts back. Walking down to see the first post of the Great Wall of China. Walking down the road we really got the sense of how open and vast the landscape is out here in the desert. It truly feels like you are in the middle of nowhere, a feeling we don’t get very often here in China. The road ends at the First Pillar, protected from behind a fence. The pillar looks nothing like Jiayuguan Fort or any photo of the Great Wall you’ve ever seen. In fact, it really doesn’t look like much of anything but a pile of dirt. It takes quite the imagination to picture the unassuming mound of rock and dirt as it stands today as the looming first outpost of the Great Wall of China as it was built during the Ming Dynasty. This post hasn’t been touched by human hands since the demise of China’s ancient dynasties, and as such has been subject to the erosion of nature. Originally 14 meters tall and wide upon completion in 1539, the remains today are only 6 meters wide by 10 meters tall. The post stands at the edge of a river cliff marking an impenetrable pass at the entrance to what was then the northern Chinese border. Walking along the fence past the First Post you can see the river just a few meters away, carving its way through the 80-meter high rock cliffs. A very strategic place indeed to start the Great Wall and create a border into the country. A couple hundred meters down from the post lies the entrance to an ancient town. There’s no telling whether this town is a reconstruction of an ancient village or built completely for the amusement of tourists, but regardless, it provides something else to see besides the one remaining outpost. The town is located on the edge of the river cliff with buildings on both sides of the river connected only by a swinging bridge which, along with being super fun to walk across, provides excellent views of the river gorge winding its way down the mountain. As we visited in the off-season, our only option to get to the town at the edge of the river was to walk down a long flight of stairs. If you go in the summer, however, you can opt for the “grass” slide instead. Gotta love their ingenuity in making a simple pile of dirt fun! Admiring the First Strategic Post with the family. The Overhanging Great Wall is the Great Wall that we’ve all been expecting. That singular line of wall snaking its way over mountain tops and through valleys. The one that’s been fully restored for tourists to climb to their heart’s content. What makes this part of the wall unique, however, is that instead of just one line of wall, the Overhanging Great Wall is branched, climbing the sides of multiple mountains simultaneously. Supposedly, when viewed from afar, the wall looks like it is hanging over the mountain tops, giving it the name Overhanging Great Wall. Heading up to the top of the Overhanging Great Wall. 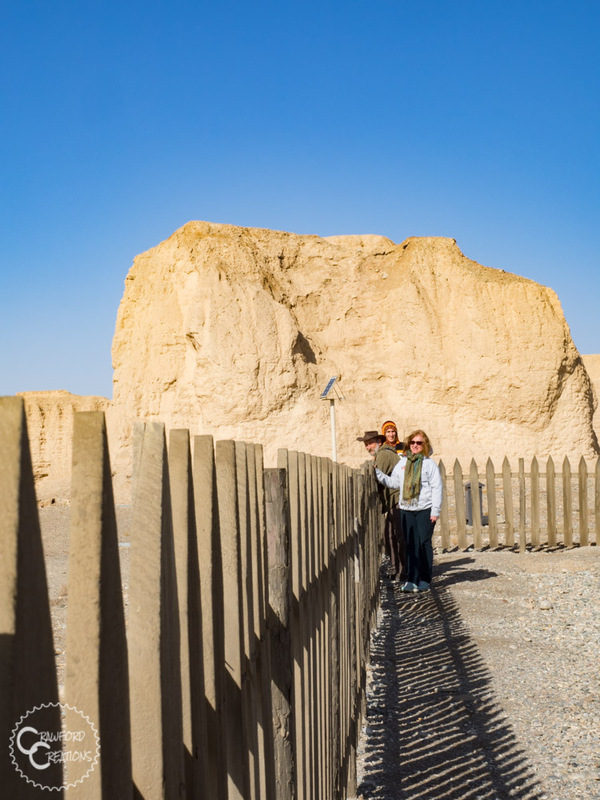 Located 14 kilometers from Jiayuguan City, this branch of the wall was originally built in 1540 standing 1.5 kilometers long and climbing straight up the mountain. Today, after being rebuilt in 1987 it stands at just 750 meters long, although still taking the same route straight to the top of the ridge line. With a steep ascent over 400 steps, it is not a leisurely walk to get to the top, but the views, as usual, are completely worth it. 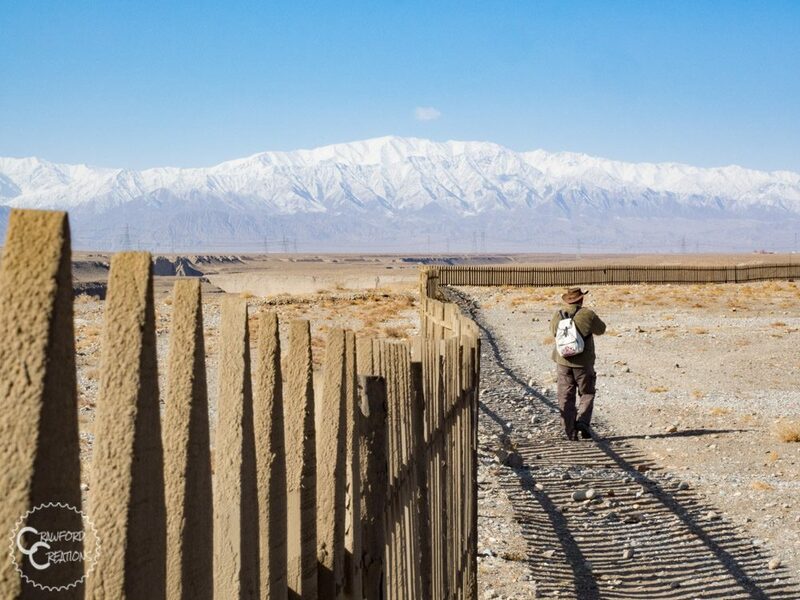 From the top, you can see another restored branch of the wall, not open to tourists, as well as the stunning snow-covered Qilian mountains, the vast open desert, and the factories of modern day China in the distance. In true tourist style, at the topmost tower of the wall you can buy a custom engraved love lock to lock onto the chain link fence symbolizing an unbreakable love. View from the top of the Overhanging Great Wall. There is a small airport in Jiayuguan with flights routing through Xi’an or Lanzhou before landing in Jiayuguan. 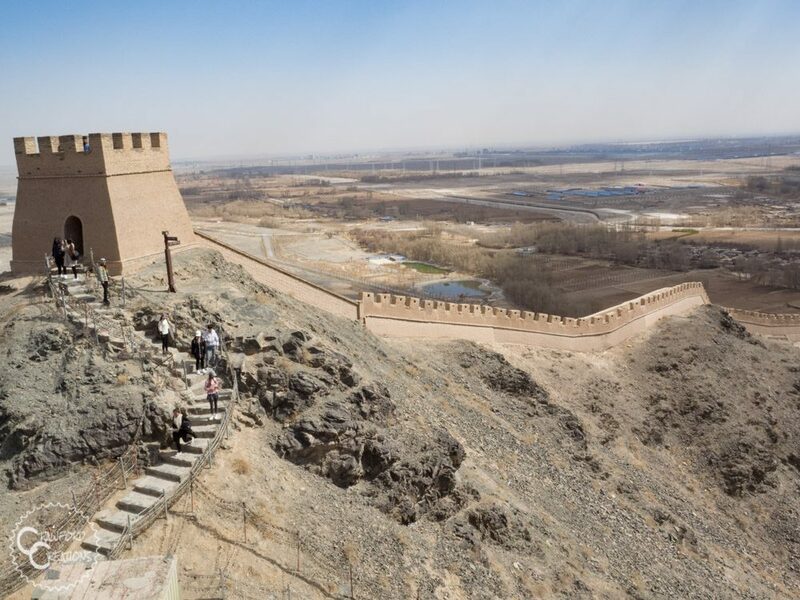 As Jiayuguan fort is the only destination close enough to the city for bus access, it’s best to hire a driver to take you to all 3 destinations: Jiayuguan Fort, 1st Pillar, Overhanging Great Wall. When we visited we didn’t even have to hire anyone as the taxi driver who took us to our hotel offered to take us sightseeing the next day. If your taxi driver doesn’t offer, just ask. Everyone seemed more than happy to drive us around for the day. 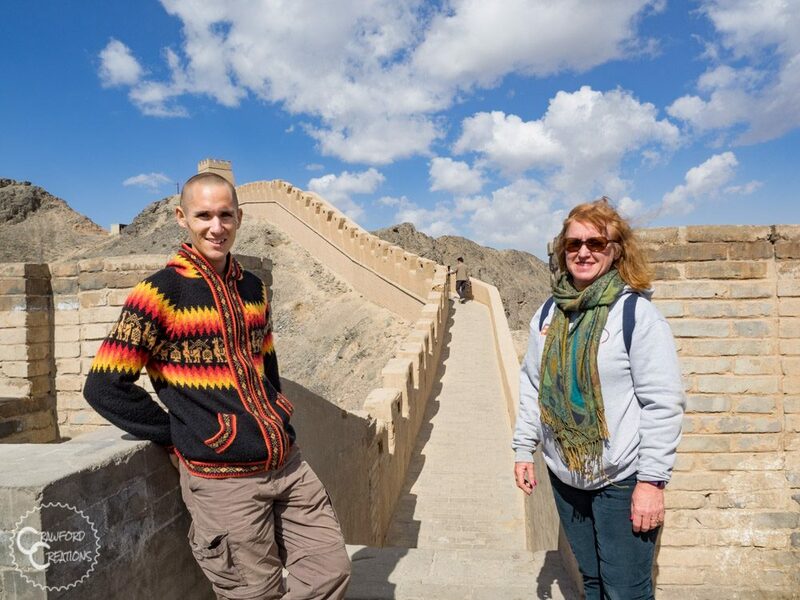 When you hire a driver he/she will take you to each of Great Wall sightseeing destinations and wait for you at each one before heading to the next. This means you can take as long as you want at each place and never have to worry about how to get to the next spot, or back to your hotel. It’s best to always negotiate a price beforehand so that everyone is on the same page. Some drivers are super nice and make great tour guides, while others are just in it for the money. Unfortunately, it’s hard to tell when you meet one which type they are so to avoid any issues negotiate a price first to avoid getting scammed with a big bill at the end of the day. How much should you pay your driver? 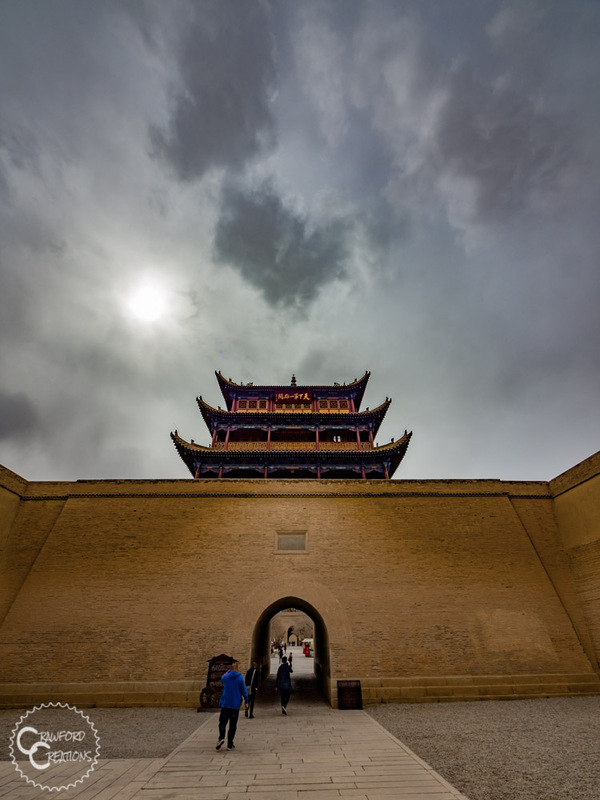 We split up the 3 sights into 2 days as we arrived in Jiayuguan in the late afternoon and only had time to see the fort. Day 2 in Jiayuguan we hired a driver for 120rmb for half a day to take us to the 1st Pillar and Overhanging Wall. For all 3 sights expect to pay maybe 200rmb. 100rmb for all 3 sites. Buy your ticket at any of the 3 Great Wall tourist sites and use the same ticket to get into the other two places. Walking towards the ancient village at the First Strategic Post of the Great Wall of China. May-October is generally the best time to visit Jiayuguan when the weather is sunny and warm. Avoid visiting in the winter time when the weather is brutally cold and often below freezing. We lucked out with our visit at the end of March/beginning of April but a week or so after leaving they got snow and the temperatures plummeted! Head to the region in the summer or early fall for more guaranteed nice weather. Family sightseeing at the Great Wall of China. Hotels in Jiayuguan are a bit tricky as a lot of the places there don’t accept foreigners. To make sure we were accepted at our accommodation we booked using Agoda as it explicitly states under each listing whether or not the hotel accepts foreigners. You can check availability and latest prices here. As stated in our Rainbow Mountains Guide we’ve never run into this issue before in any other region of China, so we just wanted to give you a heads up of what you might run into and how to avoid it. China has strict laws about how hotels must register foreign visitors. As Gansu Province is a more remote area of China, not many people speak English. In order for hotels in China to accept foreigners, they need to be approved by the Chinese government. A lot of the hotels in this region of China don’t want the hassle of, first, going through this process, and second, having to deal with people they can’t communicate with and whose standards they don’t understand. 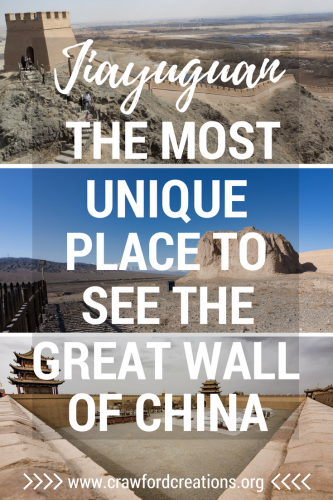 Why should you visit the Great Wall at Jiayuguan? Jiayuguan is truly the most unique place to visit the Great Wall. It’s off the beaten path, has scarcely any tourists (especially compared to Beijing) and it’s a place that very few foreigners ever get to see. Fly under the tourists’ radar and visit Great Wall of China without the crowds! We did have a great time with Justin’s parents. Got to see some cool stuff and show them around China! Very helpful. Nice picture. I am planning a trip. I am debating how long we should stay at jiayuguan before heading to zhangye. We will come from Dun Huang. Which is better? Option 1. Morning train from Dun Huang, arrive jiayuguan before 2pm, visit 3 sites , catch a evening train and stay in zhangye . Then next day we have a whole day at rainbow mountains . Or 2. Stay at jia Yu Guan that night , train to zhangye the next morning and visit San xia in the afternoon and evening. We will leave zhangye on the 3rd morning with either option . It is a tight schedule either way and Wen are family of 7, three generations. All adults. Thank you for any feedback. Wow, that is a really tight schedule. We enjoyed Zhangye more than Jiayuguan so I would have to go with option 1. With a full day in Zhangye you can do the Rainbow Mountains and Binggou Danxia as they are just down the road from each other. Thanks for your guide, this has actually changed my mind somewhat about wanting to visit – I had previously thought I wouldn’t ever go – because the version of the Great Wall in my head is magical, and authentic, however I know that the reality would ruin this magic and I don’t want to be fighting against millions of crowds.